Ah, the Holiday Cheese Ball. When you’re standing around snacking on it at a family gathering, you feel like you’ve got the most coveted spot in the kitchen. If you take this to a real live potluck, you’d better guard it fiercely so it doesn’t simply disappear while your back is turned, leaving you cheeseless and forlorn. Thankfully, this is a virtual potluck, so nobody can hork this from me. Though, I have to admit to scrambling at the last minute to put this post together since the last cheese ball I made disappeared in the middle of the night last week. Apparently, I’m not the only one in this house who is obsessed with it. Luckily, the recipe is ridiculously simple with only about 10 minutes of hands on time. 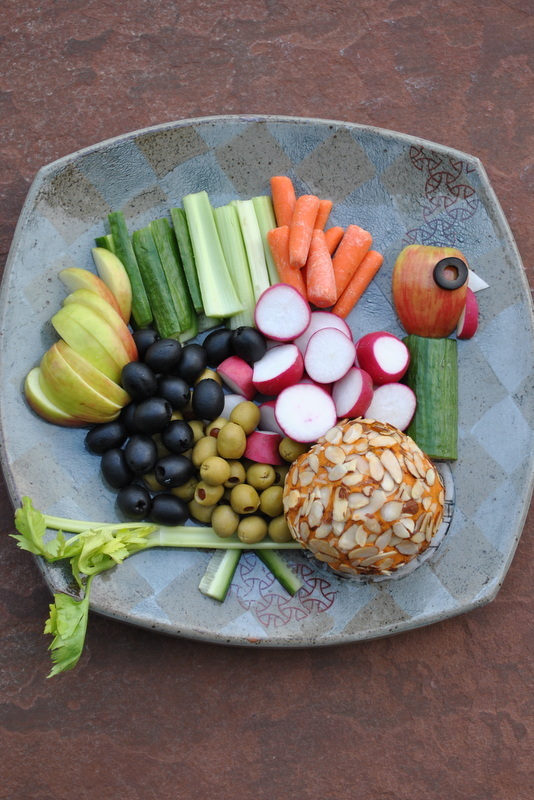 You can serve the cheese ball with any of your favorite raw vegetables, we even put sliced honey crisp apples on our tray, the combination of the sweet crisp apples and the piquant cheese was amazing. The cheese ball is also incredibly good with crackers, raw or otherwise. 2 packed tablespoons dry pack sun-dried tomatoes, snipped into small pieces with kitchen scissors then soaked in the purified water with the cashews. Note: if your sun-dried tomatoes look brownish, so will your cheese ball. Use fresh, bright red sun-dried tomatoes for best results. Pour the soaking water off the cashews and sun-dried tomatoes and then rinse them with fresh purified water. Drain well. Place the soaked cashews, sun-dried tomatoes, nutritional yeast, dry sherry, miso, apple cider vinegar, sea salt, onion powder, mustard powder, smoked paprika, turmeric, cayenne, and coconut oil in a food processor or high-speed blender and pulse until the mixture starts to form a paste, scraping down the sides as necessary. Blend or process until the mixture is completely smooth, scraping down the sides occasionally. If your food processor or blender is struggling to blend the mixture, add purified water, 1 tablespoon at a time to help it to keep turning over, using no more than 3 tablespoons of water. This process takes up to 10 minutes in a food processor and a few minutes in a high-speed blender. Scrape the soft cheese into a container that holds at least 2 cups. Cover and refrigerate for 4-6 hours or until the cheese is quite firm. Scrape the cheese out of the container and place onto a clean surface. With your hands, form the cheese into one large ball or two or more smaller balls. See notes below for topping/variation ideas. Notes: The organic unrefined coconut oil does leave a slight coconut flavor in the finished product. If you prefer, you can use refined coconut oil for no coconut aftertaste. 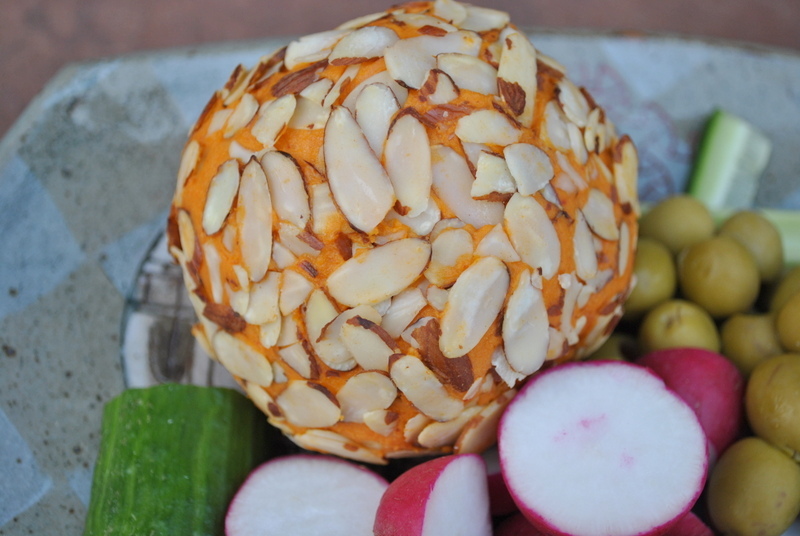 The cheese ball can be served as is or rolled in any variety of chopped nuts and or herbs. I used sliced almonds, but walnut pieces or pecan pieces with some fresh minced parsley, thyme or sage would be amazing. The cheese ball gets softer as it reaches room temperature, so it’s best if it’s kept chilled until immediately before use. Kittee at Cake Maker to the Stars created a super rad cultured version of this cheeseball here. 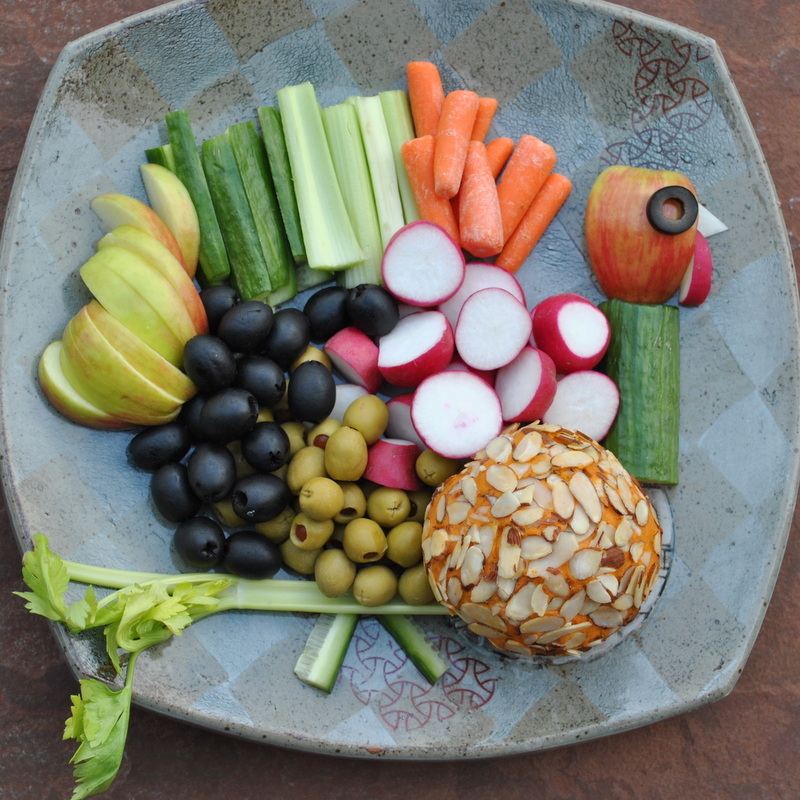 If you are in a hurry to get this cheese ball on the table, Angela Liddon at Oh She Glows made an adapted version of my cheese ball (only available in her e-book). In her very similar version, she places the cheese mixture in a parchment lined baking dish and freezes it for 30 minutes before rolling it into a ball. I’ve tried this and it works very well. 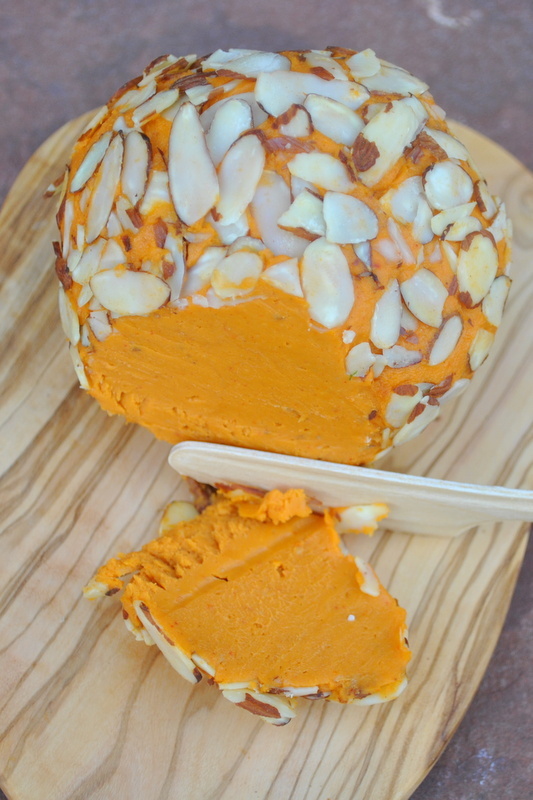 A word about coconut oil: I have had many readers ask if this cheese ball can be made without the coconut oil. You are welcome to try it, but I DO NOT recommend it. 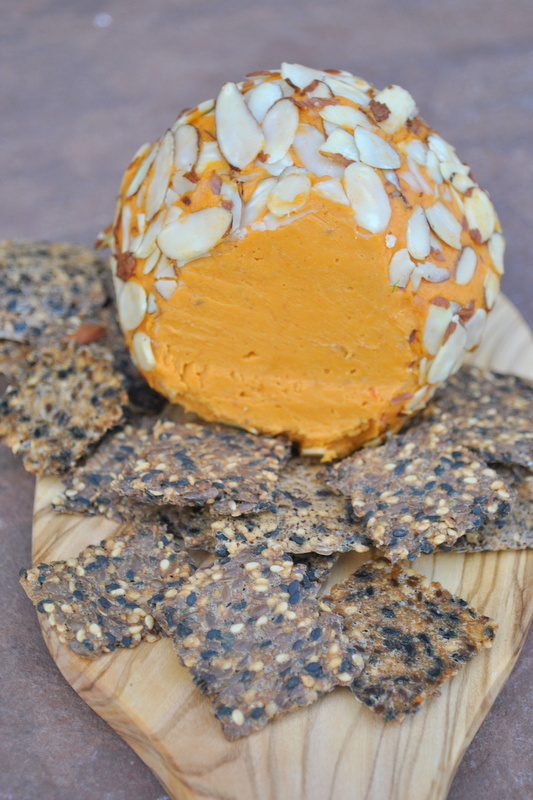 The oil adds a beautiful melty mouth-feel to the cheese ball, helps it to firm up and makes it taste ultra-delicious. This was never intended to be a low calorie or fat free food, indeed the cashews alone are very high in fat. 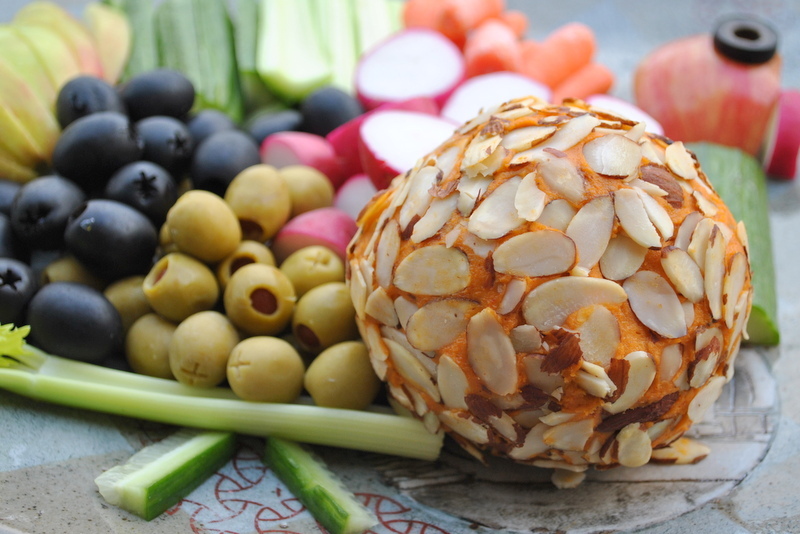 This cheese ball was created especially for Holiday or other special occasions and it is to be treated as a special occasion food. I have had readers reduce the oil by half with favorable results and you are welcome to try the same if you are concerned about the fat content, but this will still be a very rich and high fat food. If you are strictly opposed to oil for whatever reason, you could try using coconut butter instead of the oil, but I haven’t tested that in my kitchen. For those allergic to coconut oil, you could try palm oil instead, but there are concerns about whether or not this is a sustainable product, so please do your research first. If you run into any broken links along the way, (some bloggers show up a little late to the party) here’s a list of the bloggers in the potluck to help you get back on track. Pretty cool to see over 150 bloggers from all around the world flaunting their vegan awesome! Use the buttons below to Go Back to visit the lovely Holcomb Hollow. Go Forward to see what Sensual Appeal brought to the party. 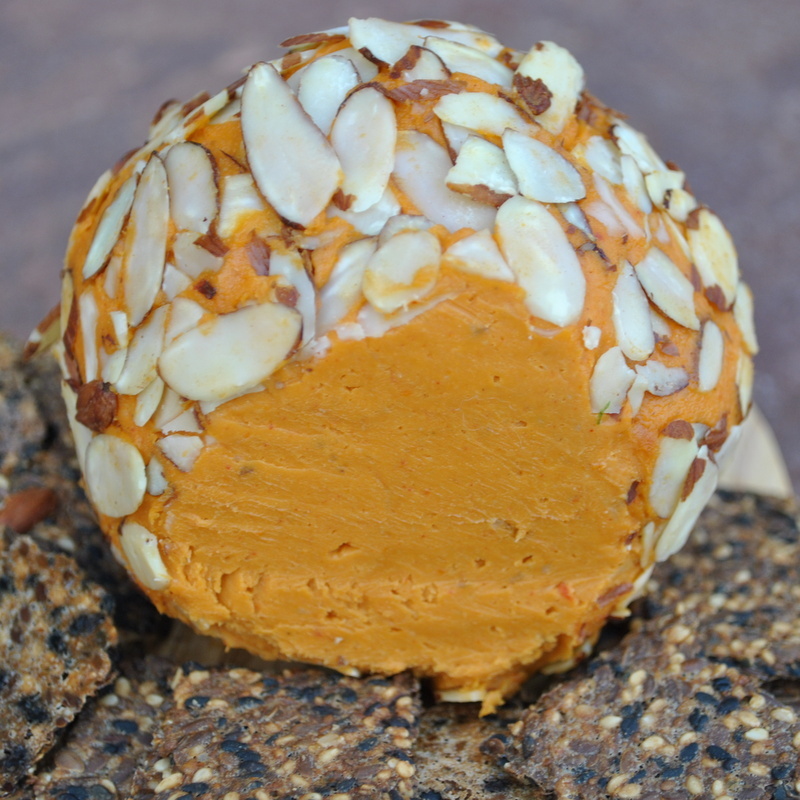 Cheese ball reviews: Thanksgiving Joy, Holy Cheeseballs, My Favorite Vegan Cheeses, Vegan Party Appetizers, LalaRaw, What I ate for Thanksgiving. Adaptations: Smoked Jalapeno Cheeseball, Vegan Buffalo Cheddar Cheese with Coconut Bacon, Party Hearty Cheeseball. Featured Articles: One Green Planet, Sunwarrior, Veg Kitchen, Key Ingredient, Chic Vegan, Buzz Feed, Vegan Lifestyle Magazine. ← Vegan Richa’s Vegan Diwali Sweets E-Book. Nan Khatai Shortbread Recipe and Worldwide Giveaway! Have you tried this with almonds? We can’t do cashews. Also, what non-alcoholic ingredient can I use to sub for the sherry and miso? I looks amazing! I haven’t tried with almonds. I think macadamias would get smoother. If you do try almonds I would recommend blanched skinless ones and maybe soak them for 24 hours in the refrigerator. Use water to replace the sherry. Miso does not contain alcohol, so you shouldn’t have any problems there. Best of luck! I’ve made cheese logs with Brazil nuts, and they get very smooth. Hope this helps! I use sumac instead of paprika for a smoky flavor; it’s also great on shish-ka-bobs. We’ve got a pepper allergy in the house. We made this again, it seems to make a much-requested appearance every holiday, and again, it was fabulous! Discovered I was out of cider vinegar in the middle of Holiday chaos, so I used 1/2 rice wine vinegar and 1/2 plain old white vinegar. Seemed to taste the same or very close. Me again – I made a second one already . . thats 2 in 2 weeks? I’m afraid this (plus glutino’s round crackers) will be responsible for significant weight gain this winter . . . . Sorry, me again – about to make my third. I finally realized – this reminds me of the Port Wine Cheddar I used to love as a kid – my mom would buy it for me sometimes as a treat, to eat on Carrs Table Water Crackers. This week I tried a new cheese I found at Whole Foods, which is safe for me – it has a great texture both melted and whole, but tastes to me exactly like a lemon cookie, both melted and cold. Which is not what I want from a cheese! I remember that Port Wine Cheddar…how funny you mentioned that! I have yet to try this, but I can’t wait. I have never ever left a comment on any blog but this cheese has inspired me like never before! It is THE BEST tasting vegan cheese I have ever tried. Now my only problem is not eating the whole batch myself! Can’t tell you how many raves I received from bringing this to gatherings. Vegans and non-vegans always want the recipe and I send them over to your blog. Thank you so much for the amazing recipe and your wonderful blog! Just wondering, is the Miso essential or is there a suitable substitute? I want to try this right now but no Miso in the pantry and really not even sure where to find it. Miso is a flavor component that is irreplaceable. You can find it at any health food store. However, if you cannot locate it, of course the cheese ball can be made without. It just won’t taste as much like cheese. Made this today and just wanted to share my improv. ingredients in case anyone is looking for substitution ideas: I used sunflower seeds in place of cashews, and I didn’t have any miso on hand so I used some thick raw tahini + a bit of tamari sauce. I rolled it into mini balls and coated them with more sunflower seeds. Turned out absolutely delicious! I’m so pleased you liked them so much! I haven’t tried with sunflower seeds, but there are a few others here that have, which is a great idea for those with tree nut allergies! I like your improv also on the miso! Biggest fattest hugs to you! I’ve made this before and i LOVED it. So did all my friends. I could only find red miso this time. Will it work instead of mellow miso? Thanks Somer for a great recipe! Yes! Red miso works fine! Your cheese will be even more orange if you use it. They are for taste and color, if you want to use tomato paste instead, I suggest 1/2 tablespoon. What kind of crackers are the ones pictured? They were homemade, but I didn’t not the recipe down. Sorry! made this for my “high fat paleo is the only way to live your life” friends and they went NUTS over it!! shocked to learn that it was vegan! Have you ever tried to make a less cheesy version of this to use as cream cheese? Most cream cheeses use xanthan or tapioca, neither of which I can handle. i keep thinking this without the spices or tomato/pepper, maybe half the yeast, lemon juice instead of vinegar (for a milder flavor). not sure about the miso, halve or drop. Try it both ways. Split the recipe between two bowls and ad the miso to one. Have fun taste testing. I like to use coconut amigos in mine, but it probably wouldn’t help color wise. So, I tried it. I made a half recipe, with much fewer ingredients – 3/4 c soaked cashews, 2 tsp nut yeast, 1/4 tsp salt, 1/4 tsp onion powder, and the full amount of coconut oil (1/4 c) . . . I think i put a little lemon juice in, too, btu i didnt write ti down so I’m not sure. i tried mixing miso in to a little bit of it, but didnt improve it for me. I had it with lox on crackers and was almost crying with joy! My boys tried it and said they liked tofutti’s better – but i cant eat it. I liked it plain on crackers, too. It seemed to get a little more flavorful over time, too – i think I had it around almost 2 weeks. I thought I posted a comment to this? I guess not? anyways, I did create a cream cheese and liked it – and now i’m considering using it for cheesecake. I’m not vegan, so I dont want a no-bake, no-sugar, no-egg cheesecake. I cant use vegan cream cheese because they all have xanthan gum in them. So I’m tempted to try to make a recipe of this, using less flavoring like cream cheese, and then turn it in to cheesecake batter . . . and cook in the pressure cooker. you have seriously inspired me with this recipe!! 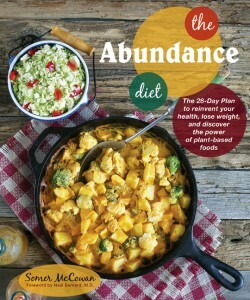 Being new to plant based diets I am very excited to try this. But I was wondering what brand those seed crackers in the picture with the cheese ball were?! Can you free this cheese once you make it? I’m allergic to tomatoes, is there any substitute that would work in place of them? This recipe looks amazing, by the way! A bit of roasted red pepper? Hi, this looks fantastic and I can’t wait to try it! Do you have a recipe for the dark colored sesame seed crackers?